Are you ever in for a sweet treat today. These No Bake Mini Strawberry Cheesecake Bites are heaven on a plate and taste great. Be sure that you watch the video tutorial now. Remember those Mini Nutella Cheesecakes that you went mad for? 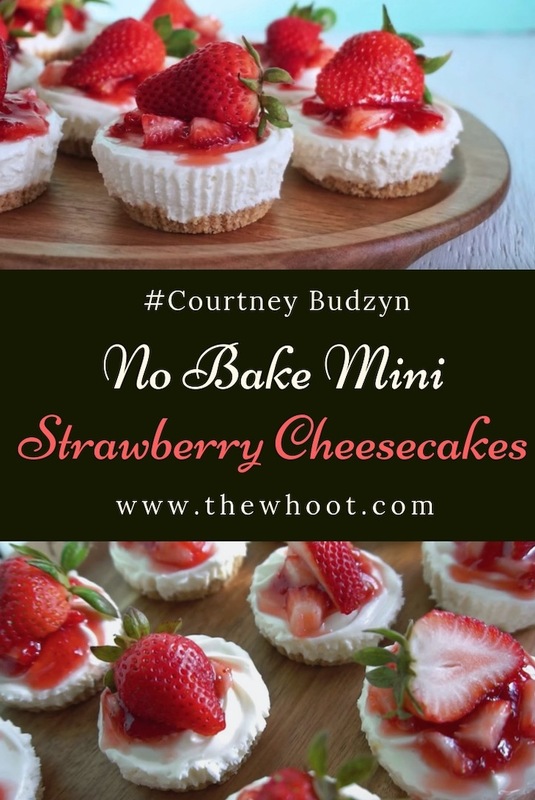 Well, Courtney Budzyn from What’s For Dinner fame is back to share another easy and delicious dessert with us. 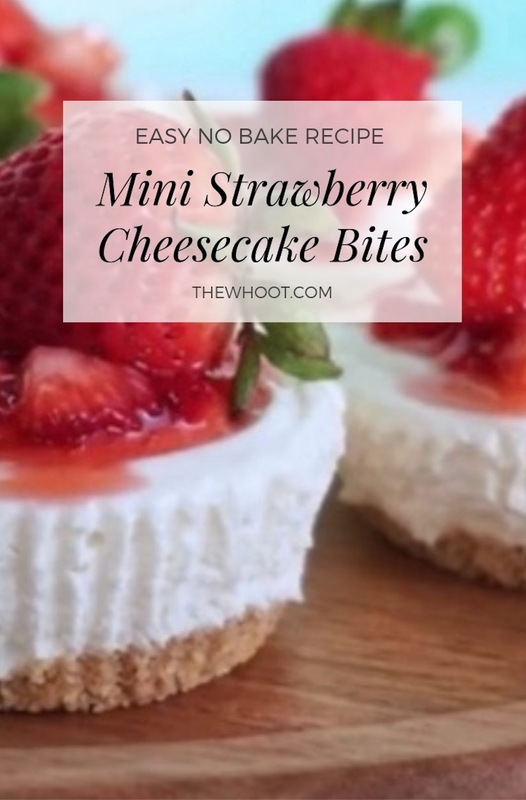 These No Bake Mini Strawberry Cheesecake Bites are truly delicious and they are super cute to boot. 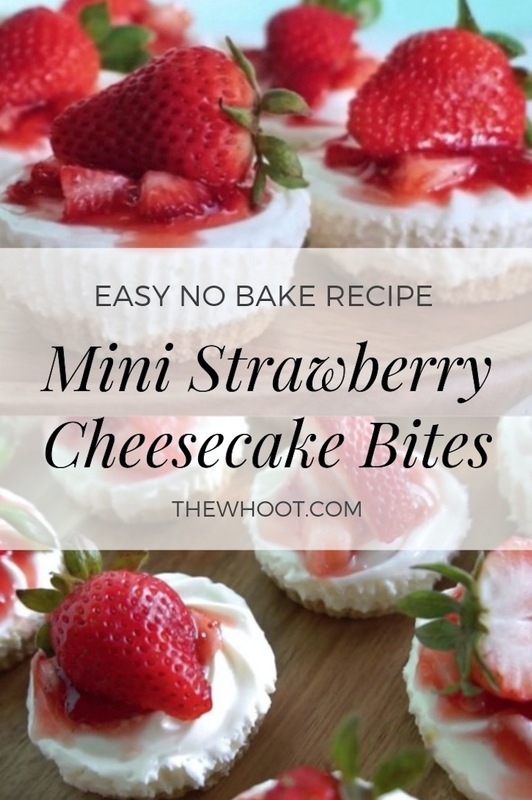 The recipe for these No Bake Mini Strawberry Cheesecake Bites will yield 12 and they are super simple to make and taste great. They are perfect finger food for guests and you will be over the moon with the results. We have outlined the recipe below for you. Prepare a cupcake pan with cupcake liners and spray with nonstick cooking spray. In a food processor, blend graham crackers until they are a sand-like consistency. Add sugar and melted butter and mix well. The consistency should be like wet sand and easily packable. Add 1 Tablespoon of the mixture to each cupcake liner. Press down firmly using fingers or a measuring cup. Place in freezer for 10 minutes. In the bowl of a standing mixer, beat room temperature cream cheese until smooth and light. Add sweetened condensed milk, lemon juice, vanilla, and lemon zest. Beat until well combined. Pipe the filling into the mini crusts and smooth the tops with the back of a spoon. In a separate bowl, combine chopped strawberries and strawberry perseveres. 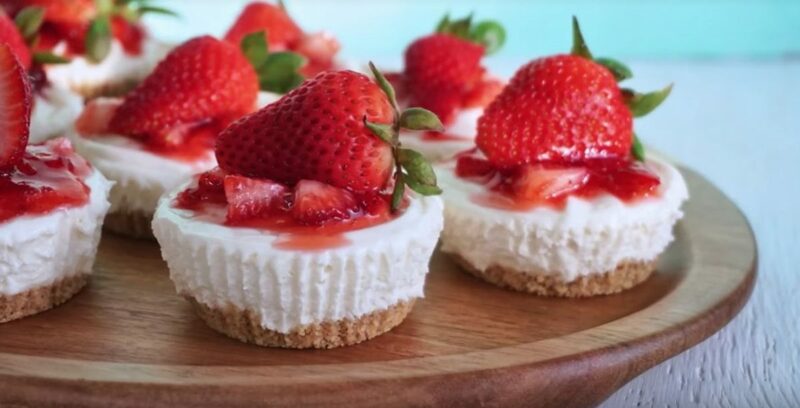 Use a dollop to top the cheesecakes and garnish with a fresh strawberry. Be sure that you subscribe to Courtney’s channel on youtube here and check out her ‘death by chocolate’ mini nutella cheesecakes here.